Drainage & dehumidification. 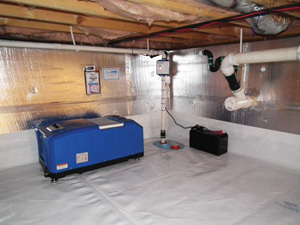 A complete crawl space waterproofing system will include a sump pump, a heavy-duty dehumidifier like the SaniDry™ unit shown here, and a perimeter drainage system as shown below. Is water leaking into your crawl space? Seepage through crawl space walls and the crawl space floor is a problem in many homes. Left untreated, a wet crawl space can easily be damaged by mold, termites, and wood rot. 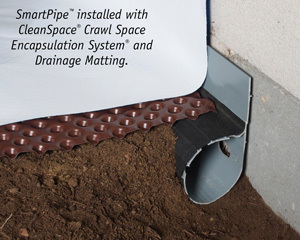 Fortunately, wet crawl space problems can be eliminated by installing an effective waterproofing system. The waterproofing experts at Power Jack Foundation Repair can install a crawl space waterproofing system that addresses all your needs. We make it easy to repair your wet crawl space by providing a free inspection. As Dallas-Fort Worth Metroplex's trusted waterproofing contractor, we serve Fort Worth, Dallas, Plano and the surrounding area. The final ingredient in a complete crawl space waterproofing system is a SaniDry® crawl space dehumidifier. A crawl space dehumidifier isn’t required in all cases, but one may be necessary in a large crawl space or a crawl space that has been wet for a long time. An ENERGY STAR® SaniDry™ dehumidifier is designed to easily handle the low temperatures and harsh crawl space conditions that can overwhelm standard “appliance store” models. Interested in our crawl space waterproofing or crawl space repair services? Contact Power Jack Foundation Repair today for a free inspection, offered to customers in Dallas, Fort Worth, Plano, Garland, Arlington, Grand Prairie, Irving, Frisco, Southlake, Mckinney and nearby Texas. Give us a call at 1-817-563-5564 or contact us online.